30 St Mary Axe, affectionately known as the 'Gherkin', is a landmark curvilinear 40-storey office building in the heart of London's financial centre and is unlike any other ever conceived. It was designed by the renowned architect Norman Foster. With distinctive tapering form that minimises its footprint and effect on the London skyline and eco-friendly glazed skin with light wells, the building also has a glazed dome at the top with spectacular 360-degree views across the city. The Gherkin is essentially an elongated, curved, shaft with a rounded end that is reminiscent of a stretched egg. It is covered uniformly around the outside with glass panels and is rounded off at the corners. It has a lens-like dome at the top that serves as a type of observation deck. The design of the Gherkin is heavily steeped in energy efficiency. There were open shafts built in between each floor that act as ventilation for the building and they require no energy for use. The shafts pull warm air out of the building during the summer and use passive heat from the sun to bring heat into the building during the winter. These open shafts also allow available sunlight to penetrate deep into the building to cut down on light costs. 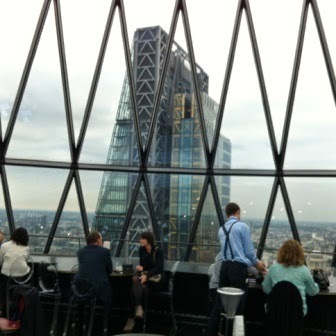 It has been said that the Gherkin uses only half of the energy that a similarly-sized tower would use. 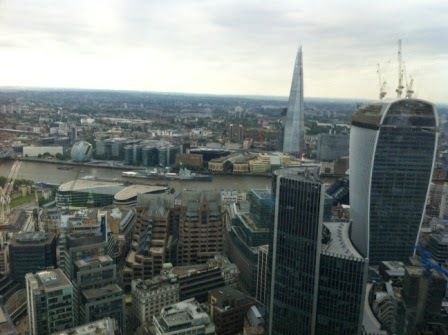 Last night two friends and I went up to the 34th floor of the Gherkin to see a Tom Phillips exhibition. The pictures are exhibited in a corridor that circumnavigates the 34th floor so it's easy to be distracted by the views over the city on the other side of the corridor! We then sat in the lounge on the same floor and had a bottle of champagne while admiring the stunning view. 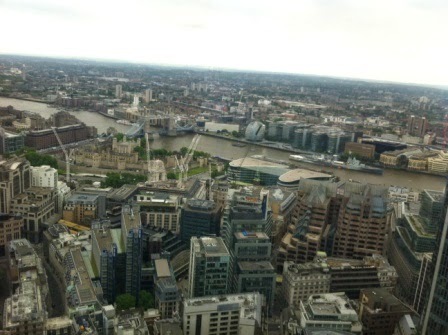 On the 38th floor is the bar which is under the glass dome. This bar is very busy in the evenings and you have to book a table. We had a look at it and there are a couple of photos below. The dome is quite extraordinary. 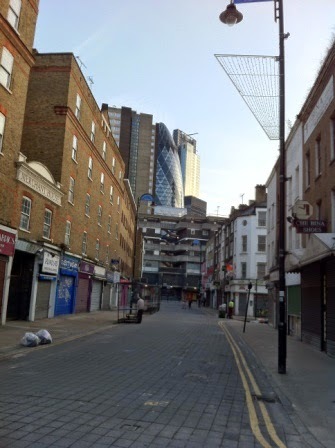 After our visit to the Gherkin we walked to Brick Lane for a curry in one of the many Indian restaurants.